Relics! Potions! Charms and more! 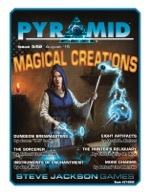 All of these and other magical enticements have been created for you in this month's Pyramid. 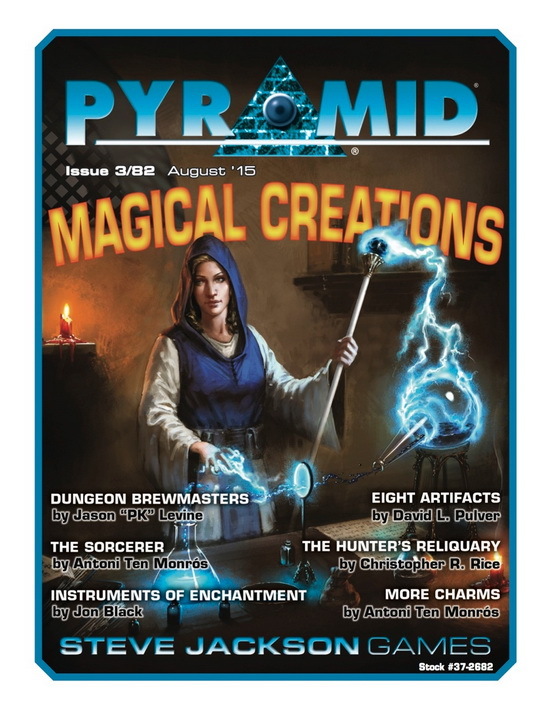 This issue's spellbinding summonings include "Dungeon Brewmasters," new rules for brewing potions and chemicals in GURPS Dungeon Fantasy, by Jason "PK" Levine, author of GURPS Dungeon Fantasy 5: Allies. You'll also get new lenses and power-ups for alchemists, plus new equipment, traits, and more! Ghoulish things come in small packages. They can also emerge from vats . . . or lurk at crossroads, awaiting the curious. 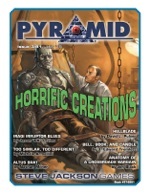 This month's Pyramid checks out the tangibly terrifying, for a suitably scary assortment of situations. 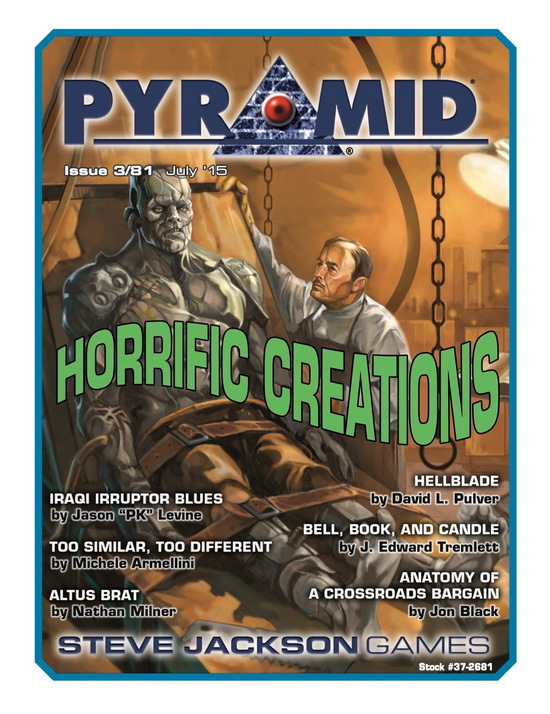 Its frightening features include "Iraqi Irruptor Blues," an adventure for GURPS Horror: The Madness Dossier, as told by GURPS guru Jason "PK" Levine. Try to find teammates who have been erased from existence, while fighting against monsters setting loose deadly memes, all in pursuit of a boxful of something . . . Danger comes in all different kinds in medieval magical worlds. Fortunately, there are heroes to deal with this plethora of perilous problems. 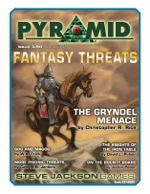 This month's Pyramid looks at fantasy threats, from crypt-crawling creatures to personal problems to kingdom-claiming connivers. 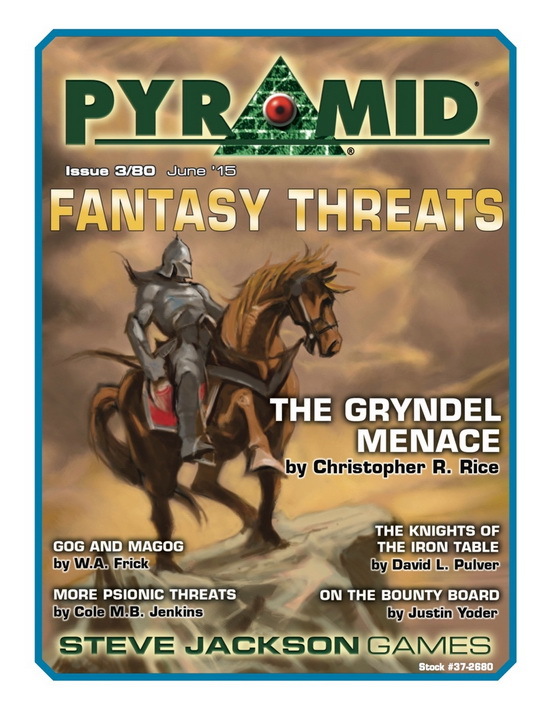 Its phenomenal features include "The Gryndel Menace," terrifying creatures that may have inspired the legends of dragons – before maturing into something much worse! Discover GURPS stats for the monster in its various life stages, information on the deadly infection it inflicts, details on other strains of the terror, insight into how to use it in various GURPS campaigns, and other awesome info. If you've got a spaceship, you likely want to leave our solar system and travel to new worlds. 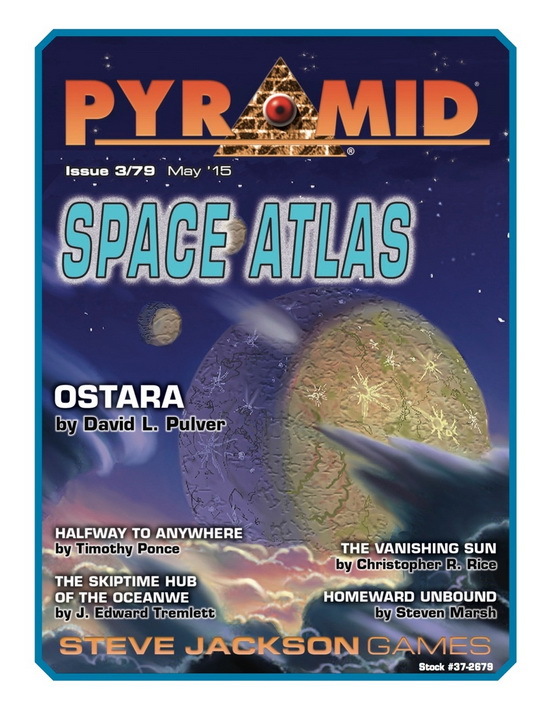 This month's Pyramid can help by providing new planets to explore and ways to get there! This passport to the unknown includes "Ostara," a colony of outcast Earth troublemakers who have turned into something else, thanks to a psionic-inducing plague. 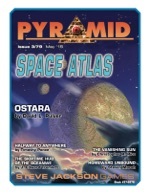 Presented by David L. Pulver (co-author of GURPS Bio-Tech), this setting features the planet's history, situation, and GURPS stats for its oft-dangerous native life. Heroes and villains are often made of sterner stuff than the rest of humanity. They've got fortitude. They've got style. Most of all, they've got spirit! 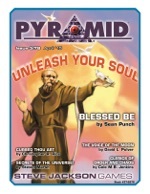 This month's Pyramid looks at the power of the spirit, and how it can be used for good or nefarious purposes. Our soulful selections include "Blessed Be," an extensive deconstruction of the Blessed advantage from GURPS guru Sean Punch, with lots of ways to refine its scope and abilities. Now you can become Angel-Blooded, a Wilderness Guardian, or a Speaker for the Gods . . . or countless other options you can build and use yourself! One of the joys of RPGs is the ability to solve a whole range of problems with good old-fashioned battle. This month's Pyramid looks at matters great and small, past and present in relation to GURPS combat. 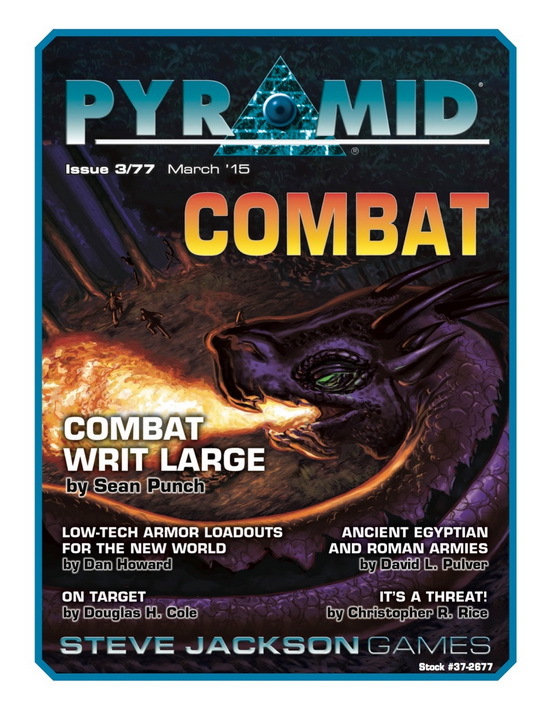 This action-packed issue includes "Combat Writ Large," a detailed compilation and expansion of all things size-related, from GURPS guru Sean Punch. Finally, the rules you need to battle giants, dodge deadly face-eating aliens, or grapple gremlins are in one place! The teeming tombs of vile creatures are chittering with excitement and they're dying for you to visit! 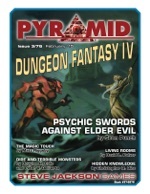 This month's Pyramid returns for a fourth time to the realm of GURPS Dungeon Fantasy, with a trove of articles sure to interest players and GMs alike. 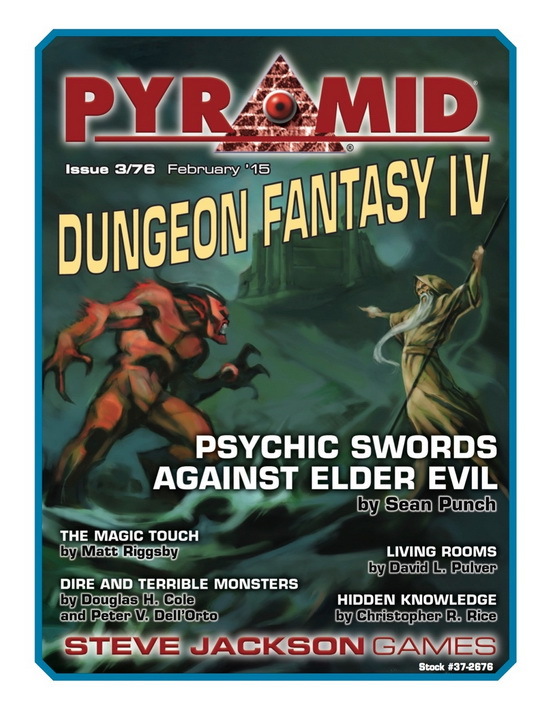 This issue includes "Psychic Swords Against Elder Evil," a follow-up to GURPS Dungeon Fantasy 14: Psi by that volume's author, Sean Punch. It presents the psychic slayer template, plus abilities, power-ups, new enemies, and much more! Sure, you can say that being a hero means trying to do the right thing in bad situations. But the truth is, sometimes you're doing it for the loot. 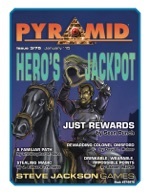 This month's Pyramid looks at rewards, gifts, and stuff that heroes can use . . . whether they're in the past, present, or future! 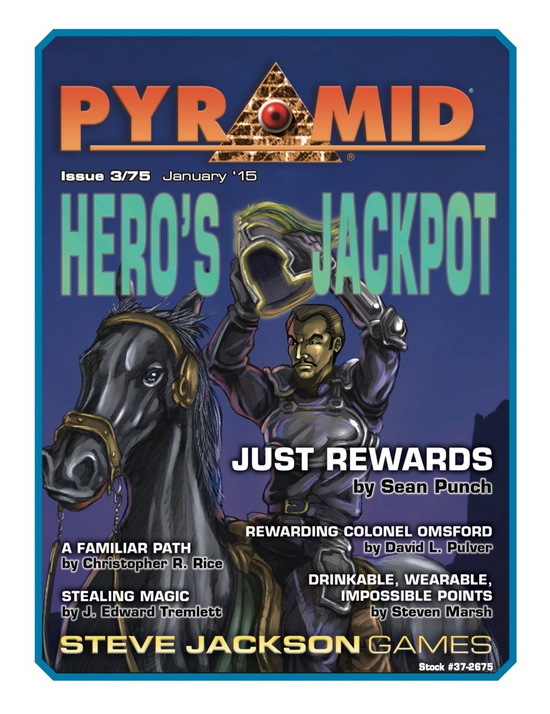 This vault of awesomeness includes "Just Rewards," a mini-supplement that suggests new and different bonus abilities for GURPS Dungeon Fantasy adventurers, from that series' mastermind Sean Punch. Gain the power of mingled trollblood, become a saint of the city, or have a psychic awakening! There's a strange newcomer in town . . . one that promises to shake things up for outlaws and marshals alike. 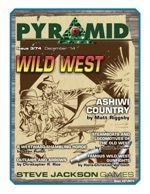 It's this month's Pyramid! 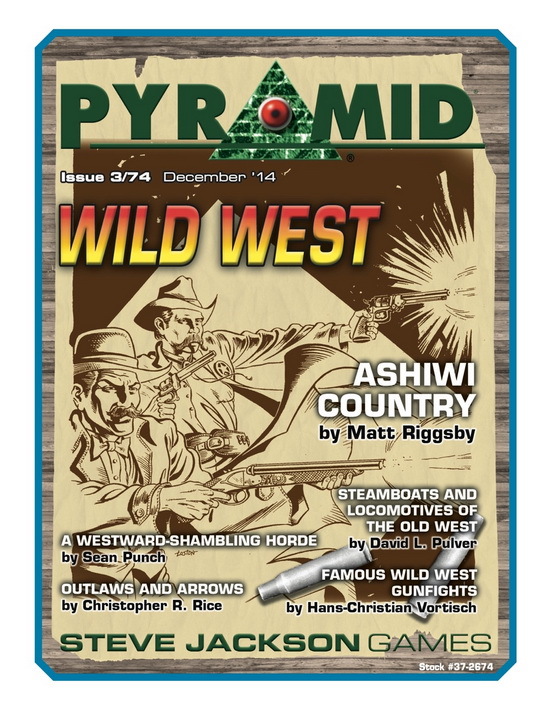 In this issue, we turn our steely focus toward Wild West gaming. The gold mine that awaits you includes "Ashiwi County," an in-depth look at the Ashiwi (or, as the Spanish called them, the Zuni) of late 19th-century New Mexico. This guide from Matt Riggsby – in a similar vein as the GURPS Hot Spots volumes he's penned – offers information on the history, religion, government, and more of this Native American culture. It also features two color maps of their central settlement. 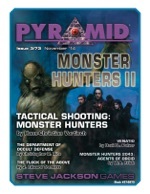 Keeping the monsters at bay takes skill, courage, resources, luck, and a secret or two. You'll get most of those with this month's Pyramid. This arcane collection takes on the fight against the forces of darkness, with a special emphasis on GURPS Monster Hunters. 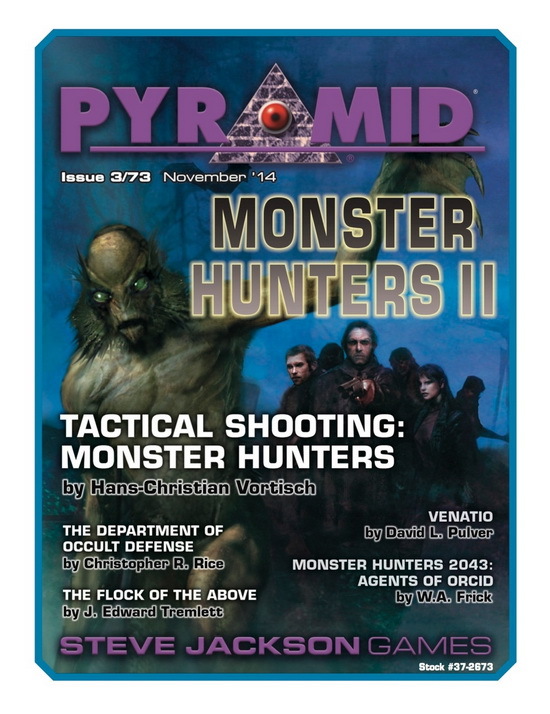 This issue's awesome arsenal includes "Tactical Shooting: Monster Hunters," a guide from Hans-Christian Vortisch that arms you with three new shootist styles to apply the advantage you gain from Hans' GURPS Tactical Shooting to the fight against evil.